Meet Mitch Rorick, our Boychoir Director. Mitch is starting his 3rd year with FWCC. He earned degrees from Wheaton College, Indiana University, and Florida State University. 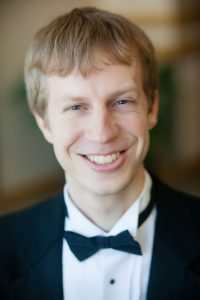 In addition to directing with FWCC, he is the Associated Director of Music at Trinity English Lutheran Church, serves on the faculty at Indiana University-Purdue University Fort Wayne, and is a vocal artist with Heartland Sings. 1- What do you like best about working with FWCC? I enjoy working with the students the most. It’s wonderful to have so many talented and supportive colleagues, as well. 2- What is your favorite FWCC memory? For me, I cherish the moments when the students light up with joy and excitement as they participate in choir together, learn something new, and create beautiful music. 3- How would you describe the culture of FWCC? The FWCC culture is fun and welcoming, while also steeped in artistic and educational excellence. 4- In your own words, why should a child consider joining FWCC? Children should join FWCC because it’s FUN, a place to make lasting friendships, and provides educational and leadership opportunities.